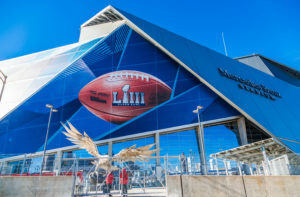 We took the liberty of compiling some fun ways to enjoy Super Bowl weekend in Atlanta – most importantly without breaking the bank! You can catch the game from the best seats in the house – your house. CBSSports.com will live stream the entire Super Bowl event, for free. No cable subscription necessary. Want to get out of your house to enjoy the game, but away from the huge crowds bound to be downtown? Visit any of the popular bars and restaurants in the Inman Park/Eastside Beltline area. Our personal favorites are: Hampton + Hudson, The Albert and New Realm Brewery. Great Exploration Tours will host two special brewery crawl “road trips” on Friday, February 1 in celebration of Super Bowl LIII. Enjoy beer, music and a bus load of fun as you tour some of the best breweries our city has to offer. Tickets are $53 and available for purchase here. If you are determined to be a part of the Super Bowl festivities happening downtown, plan ahead and take public transit to ensure you get to your destination safe and sound and with the least hassle. To accommodate visitors and residents, MARTA, Atlanta’s public transportation system, will be offering 24-hour service during the Super Bowl weekend. MARTA even has a limited-time Commemorative Super Bowl LIII Breeze Card for purchase. From Saturday, January 26 – Saturday, February 2 at Centennial Olympic Park, enjoy family-friendly activities and entertainment. The Atlanta Super Bowl Host Committee is putting together a free-to-the-public fan village, Super Bowl Live, featuring concerts produced by Atlanta’s very own Jermaine Dupri. While this is a free event, it is located in the heart of the action at Centennial Olympic Park, so plan accordingly. Hosted by Hyundai, Super Bowl Experience is the NFL’s interactive theme park happening at the Georgia World Congress Center (Building B) from Saturday, January 26 – Saturday, February 2. Enjoy exhibits and interactive games, collect NFL player autographs and take part in more Super Bowl-themed fun for all ages. This event will feature variable ticket pricing for the first time ever. According the Super Bowl Experience website, “with the purchase of one $20 adult ticket, up to 3 complimentary tickets for kids 12 and under will be offered at the Super Bowl Experience Box Office only Monday, January 28 through Wednesday, January 30.” These tickets can be purchased exclusively through Ticketmaster.com. As we get closer to Super Bowl Weekend and more exciting news is revealed, we’ll be sure to update you on fun and inexpensive ways to enjoy it. Tell us what you’re looking forward to for #SBLIII. Visit c21’s Facebook, Twitter or Instagram.